Professional color for less than lasers: Look professional with every page, using Original HP pigment inks for vibrant, durable prints. 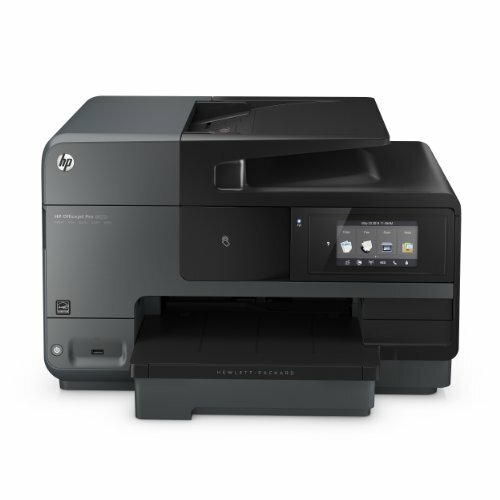 Set the pace for success with fast printing speeds—up to 21 ppm black-and-white and 16.5 ppm color. Attract new customers with borderless, double-sided marketing materials that help your business stand out. Print on your terms: Print with just a touch from your NFC-enabled smartphone and tablet. Enable secure wireless printing from your mobile device—no router or access to local network required. Easily print photos, documents, and more when you're on the go, using HP ePrint. Set a new pace for productivity: Easily manage all your tasks and access apps—just tap and swipe the 4.3-inch (10.9 cm) touchscreen. Speed to success with fast double-sided printing of text documents and borderless color marketing materials. Breeze through multipage documents with automatic two-sided scanning and a 50-page automatic document feeder. Showcase your business, and make a professional impression with high-quality color printing for up to 50% lower cost per page than lasers. Print from your smartphone, tablet, and notebook across the office or on the go. It's simple and direct-even without a network-using wireless options or NFC touch-to-print technology. Use Ethernet for wired connectivity. Handle more tasks without slowing down. Help enable business growth with an e-all-in-one you can count on to be easy to use for every task.